001. Give me a bit of break if I'm not posting much right now. I'm not quitting blogging or whatever, I'm just busy with other stuff and have so much university work to be getting on with. Like most people know, I'm in my last year of university so its really my main focus at the moment. Thing is its not the summer anymore, I don't have loads of free time either, plus my job is different from what it was last year and I get home much later. Excuses, Excuses. But its the truth. I really don't like being asked when my next post will be because I don't know when it will be and its not my fault. I do want to blog, I just dont have time.You all know that there are so many amazing blogs out there, and I trust they can tide you over until I'm back to my usual form! So yeah, please just bare with me till things aren't so crazy! 002. Ring update, all rings that have been ordered so far (turquoise ones!) have either been sent or being sent tomorrow. Brilliant news that the Cross rings are due tomorrow and I hope to get them out by the end of the week! Have tons of new styles coming in this week although I doubt that I'll be updating the shop now till after my deadlines! This is by far my most favourite sunday post ever, love it!! definitely one of my fave sunday pics ;) fit as. good luck with your deadlines and every thing, hope you get them all out of the way soon. Haha this cracked me up a lot! Good luck with uni work! Definitely takes priority over blogging! cute pic! Good luck with all your university work, it all finishes too quickly. Definitely feel you. It's hard to blog when school work is piling up. I'm on my last year too. Good luck with your school work! last year is hideous :( hope it's going okay. xo. You're forgiven! Lol. Keep up with your work. I am the same with my blog. Just far too busy to blog everyday. I feel bad, but I just can't help it. So, I know what you mean! Good luck with your work, I'm dreading having to write my dissertation next year. 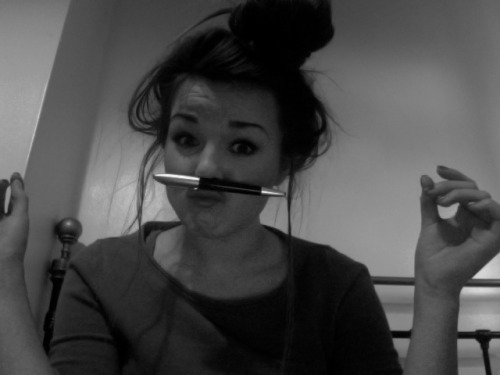 Your hair in the pic is exactly how I tie my hair if I'm getting my 'serious uni work' head on. Last year of uni is so busy, I don't blame you for the blogging taking back seat. All the hard work will be worth it in the end! Its so good that you prioritise your work etc, it's easy to let blogs run your life! Funny picture! And there's no need to be sorry, people understand that you have other priorities. Hope the uni work goes well! Good luck with all of the university work! i love this picture.. you look so cute. People need to understand you have a life behind the blogging. Good luck with your uni work. I'm in my final year at uni too so I feel your pain! So much to do and so little time. Can't believe how fast 3 years has gone. Hope it all goes well for you! Best wishes with the uni workload as well as your job, hope you find time to relax! Ahh I'm going through dissertation stress atm too. But as opposed to you, I've done no work! So not only should I be inspired by your blog but work ethic too! Stop kicking yourself. Life is more important than the blog world. Enjoy living while you can! Great pic, I can't master the art of doing that with a pen though haha! Glad the rings are back, they look beautiful. Ugh, I have two essays due for next week! Soon I will be making the pen moustache face as well! Everybody deserves a break from blogging, darling. It's very time consuming! Put your mind and efforts into school, I say. We'll all catch up with you when you're out :) Hope all is well! You have to make sure your life comes first before blogging. Nothing wrong with that. i know what you mean with the school work. love this post. good luck with univeristy hon. I won't be starting univeristy for a couple of years now. Get through it fast and quick because I would love to see you more often. you're adorable. what are you taking, by the way? Good Luck with all your university stuff! All the best with your uni work. It will be over soon! Lily, I'm also in my final year of Uni. and totally understand the feeling. I almost wish all my fav. bloggers would post less (only right now!) so that I spend more time on Uni work and less time on the interwebz! Good luck, and you're almost done! You shouldn't be pestered anyway, that's mental. Love your look's always highstreet and affordable, keeping it real. It's almost a comfort to hear that a successful blogger like yourself struggles with getting posts in among all her other responsibilities. As a new blogger (and a very busy PhD student), I get frustrated when I feel like I have no time to post and hearing this from you gives me confidence to keep going. I just have to remind myself not to stress and just post when I can.